Detailed below are the instructions on how to make a request in the ATLAS Scheduler app. If you follow these instructions, but it seems like options are missing or that the app isn’t working, it may be a technical issue. Email ATLAS at atlas-apps@illinois.edu for additional support if the guidelines below don’t answer your question(s). Next: Hover over the “Requests” tab in the upper left-hand corner and click “Create New Request”. 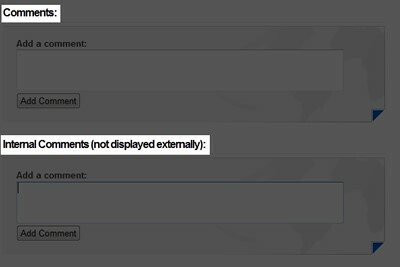 Choose the term for the request and click either “Full Semester Request” or “Single Event”. Full Semester Request - room will be needed on an ongoing basis for the entire term. Single Event - a one-time room request. Indicate whether the request is for a course or an event. 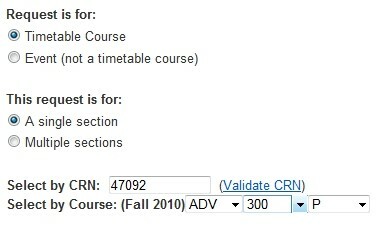 · Select a course by typing the CRN and clicking “Validate CRN” OR (for multiple sections) using the dropdown menus to specify the department, course number, and section. · Use the dropdown menu to select a department and type the name of the event below (ex: “Staff Training”). Select who the request is being created for. · Select this option and click Next. · Type in the user’s NetId (NOT e-mail address) and click “Validate NetId”. · Find a user’s NetId by clicking “Lookup NetIds via PH” above (this will open a new tab/window). Indicate the maximum attendees (total people expected to attend) and the number of computers needed. Type in the meeting date and start/end time of the course/event. Indicate how often it reoccurs. · Every Day - the course/event occurs every day (S, M, T, W, T, F, S) until the indicated end date. 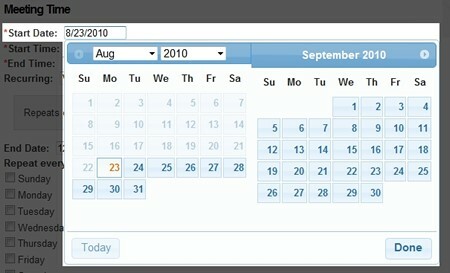 Next to "Repeat every" use the dropdown menu to indicate the number of months that pass between each meeting. Choose "1" if the meeting occurs every month. Choose "2" if the meeting occurs every two months, etc. · Every Weekday - the course/event occurs every weekday (M - F) until the indicated end date. · Every Mon, Wed, and Fri - the course/event occurs every Monday, Wednesday, and Friday until the indicated end date. · Every Tues, Thurs - the course/event occurs every Tuesday and Thursday until the indicated end date. · Weekly - the course/event occurs every week on the specified day(s) until the indicated end date. 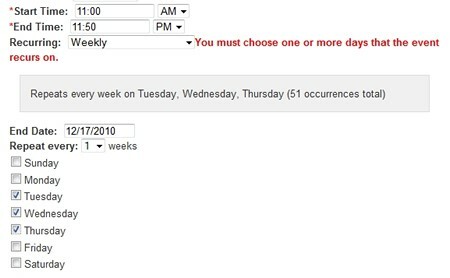 Next to "Repeat every" use the dropdown menu to indicate the number of weeks that pass between each meeting. Choose "1" if the meeting occurs every week. Choose "2" if the meeting occurs every two weeks, etc. · Monthly - the course/event occurs every month on the specified day until the indicated end date. Select the check box next to the desired room(s). · Click “Add Another Meeting Time to Request” at the bottom. 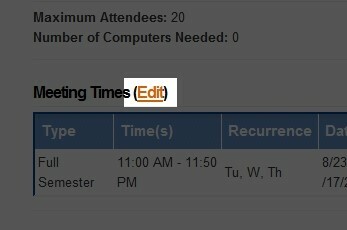 · The previously added meeting time should appear at the top. · Type in the meeting date, start/end time, and any recurring information of the next section. · Select the check box next to the desired room. · Repeat to add another meeting time. Add any additional people associated with the request (instructors, teaching assistants, etc.). Type in the user’s NetId and click “Validate NetId”. Add any resources needed to accompany the requested room. Locate the resource by selecting a category and sub-category. Select the check box next to the desired resource(s). 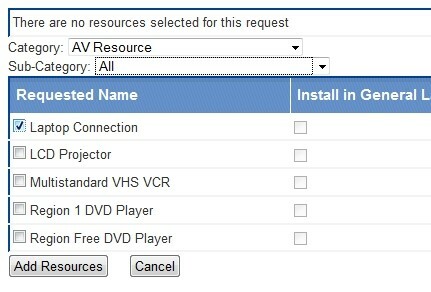 If a resource cannot be found, find the “Not Listed” option under category or sub-category. · Give the resource a specific name. · Click “Add Resource to List”. **Full Semester Requests** If the room will be needed for a final exam held after December 9th indicate this in the box below. Add any additional comments to be displayed publically or privately. Review the information regarding the request. If any information is incorrect, click on “Edit” to go back to that page.